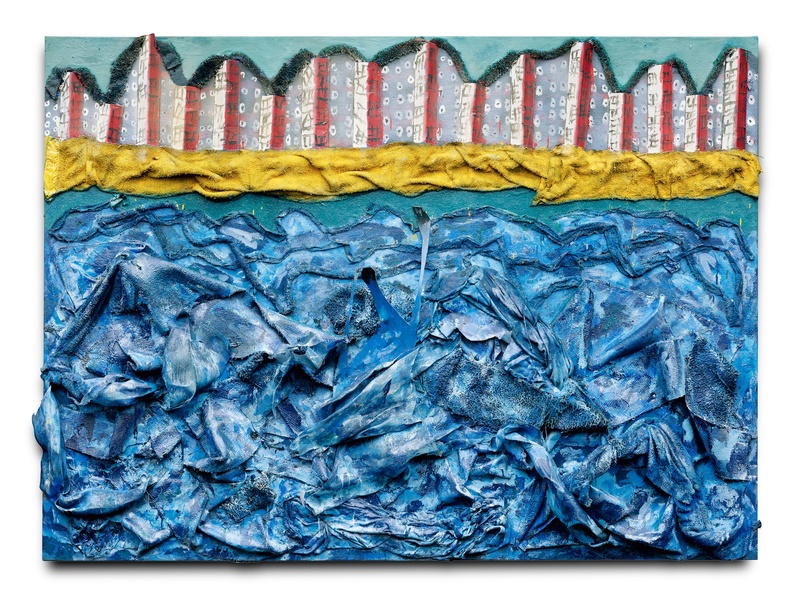 In 2003, Dial traveled to Texas to visit the Museum of Fine Arts, Houston, the host of his upcoming solo exhibition titled Thornton Dial in the 21st Century. In 2003, Dial traveled to Texas to visit the Museum of Fine Arts, Houston, the host of his upcoming solo exhibition titled Thornton Dial in the 21st Century. During that time he was invited to Galveston, where he saw the Gulf of Mexico for the first time and was told a story about refugees from Mexico making trips across the Gulf in handmade rafts. In this painting, Dial sculpted and painted the skyline of Houston, or of America, a mirage-like construction, growing from the golden sands of hope and opportunity. A figure made from a found piece of plastic swims in the water, reaching for the elusive shore or on the verge of drowning. Dial purposefully leaves us in this moment of uncertainty, highlighting the questionable nature of opportunity and the possibility for advancement in modern America.